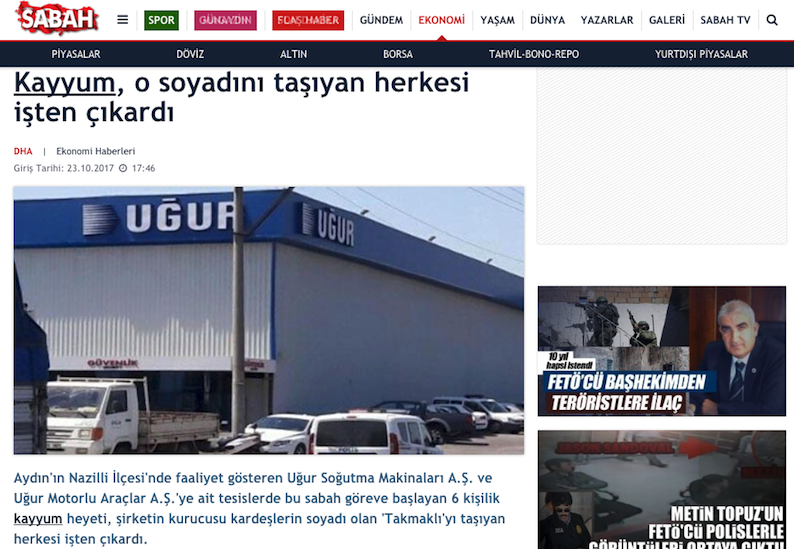 A trustee panel of 6, appointed to run the government-seized freezer company Uğur has dismissed all personnel bearing the same surname with the owners. An Aydın court ruled to seize Uğur along with 47 other enterprises over their alleged links to the Gulen movement earlier this month. Pro-government Sabah newspaper reported that government-appointed trustees took office Oct 23, fired all company personnel with the surname, Takmakli on their very first day. Jailed only 13 days after the last year’s failed coup, Ünal Takmaklı, one of the founders of Uğur, died of a heart attack in prison in November 2016. Unal’s brothers and current owners of the company, Ali and Mehmet Takmaklı, also spent some 8 months before being released pending trial in March, this year. The government blames the Gulen movement for the July 15, 2016 coup attempt while the group denies any role. Nearly 1,000 companies with a total value of $12 billion in assets have been seized and then transferred to TMSF since the coup attempt. The companies in question were mostly targeted as part of the government crackdown against the movement.